MARKETING experts say that potential customers have to hear something seven times before the message sinks in. And the famous `Rule of 7’ has its place in politics too. A series of significant stories are emerging in Northern Ireland – they have been simmering below the surface for a while, though they have never forced their way into the popular consciousness. But developments over the last 24 hours suggest that could be changing. There is increasing awareness of the impact of Sinn Féin’s growth in the Republic, of demographic trends in Northern Ireland, and of the reality over the `culture war’ around flags and parades. The two parties that run Stormont are locked in a major dispute over the stalled implementation of welfare reform. The DUP feels the time is right to accept the cuts, given that the UK government has made concessions and is warning that failure to comply will see major financial penalties being imposed. Sinn Féin, however, says the parties should seek to squeeze more out of London in a fresh round of negotiations. But the real story behind the deadlock is starting to surface more clearly than before. The Detail has previously reported on Sinn Féin’s growth in the Irish Republic, but the issue barely registers in political discussion in Northern Ireland. Since the party made its southern breakthrough in the general election of 2011, it has climbed the opinion polls and while nothing is certain, it could potentially challenge for a place in government in Dublin in the not too distant future. Unionists have studiously avoided any public reference to these developments. But yesterday the DUP leader Peter Robinson revealed his party’s deep dissatisfaction that Sinn Féin decision-making in Stormont is “subservient” to the party’s needs in the Dáil. 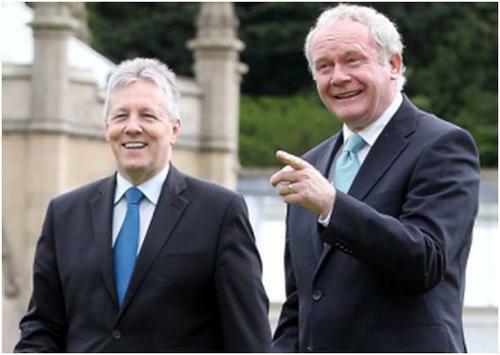 Mr Robinson claimed he had negotiated a package on welfare reform with Martin McGuinness at Stormont, which unionists expected the Sinn Féin leadership to rubberstamp. But Mr Robinson said: “I was called in on a Saturday with Martin, who had come down to tell me that he had been unable to get the package through their party organisation." The claim is that Sinn Féin is not opposing the welfare cuts because the concessions from Westminster represent a bad deal, but because the party cannot impose such cuts north of the Irish border, while campaigning against them in the south. The DUP also says that Gerry Adams, who is now leading his party from Dublin, is making it “very difficult to get decisions” made in Belfast. Republicans have privately said they want to protect their party’s growth in the south, but that they are also committed to protecting the poor from austerity cuts in both parts of Ireland. It doesn’t matter which account of the impasse is correct. The result is that the DUP has been lumbered with an extra cross-border body: Sinn Féin. A new report has highlighted two other key developments. The Northern Ireland Peace Monitoring report is an annual `x-ray’ that captures data on life in Northern Ireland, often exposing uncomfortable realities. Written by Dr Paul Nolan and produced by the Community Relations Council, with support from the Joseph Rowntree charitable group, the latest edition is packed with striking facts. The document illustrates more clearly than ever the extent of population trends. The Detail reported on the population shifts when the most recent census figures were published in December 2012 – in the same month that the row erupted over the decision to restrict the flying of the Union flag at Belfast city hall. We returned to the subject following the collapse of the Haass talks at the start of this year – when we reported on speculation over the long-term implications for Northern Ireland’s constitutional status. The census showed that the Protestant population in Northern Ireland has fallen below the symbolic 50% mark – with Protestant numbers at 48% and Catholic at 45%. The Peace Monitoring report points to the future trajectory, showing that most older people are Protestant and most younger people are Catholic. Fundamental political questions are raised by the fact that while the Northern Ireland state was created nearly a century ago with an overwhelming Protestant/unionist majority in mind, it now appears that majority status is gone. There is the potential for an eventual Catholic/nationalist majority. And while that demographic clock may tick along slowly, the implications are already being felt. In Belfast, for example, unionist parties have responded to the flag row – and the loyalist riots that accompanied it – by signalling that unionist strength can be restored on the city council if more unionists register to vote. The reality is that, looking into the future, unionism is unlikely to have the numbers to secure a majority in the city. The demographic see-saw has reached the tipping point. The future in Belfast is one of compromise. Deprived unionist communities have claimed there is a `culture war’ on British symbols and loyal order parades. But the Peace Monitoring report found that the evidence points instead to “a loyalist culture that is flourishing”. :: There are currently 660 marching bands, “the highest total ever”. :: In the last 12 months more than £2million was provided by the European Union for a new Apprentice Boys visitors’ centre in Derry-Londonderry, while Ulster-Scots received £2.7million funding in the last year, and the Orange Order “received a grant of £900,000 from the European Union to help address the legacy of the Troubles in the Protestant community”. :: Attacks on Orange Order halls have declined from “a peak of 72 in 2009/10 to 27 in 2012/13”. It is certainly the perception within sections of unionism that its culture is under attack. But on the basis of the evidence, it is an argument that could prove increasingly difficult to maintain. The Peace Monitoring report does, however, sharpen the focus on a depressingly familiar tale that has a deep impact on unionist communities – but one which has failed to get the required attention. The hope-sapping story of educational underachievement among Protestant boys from deprived backgrounds is revealed by the report to be of an even more depressing nature than previously demonstrated. This group of children is shown again to be the worst performing in Northern Ireland. And when their exam results are put in a UK-wide context, these Protestant boys are performing as poorly as children from the hard-pressed Traveller and Roma communities – placing them at the bottom of a league table of more than 30 social groups. The same graphic shows that Northern Ireland’s top-performing school group, Catholic girls who are not entitled to Free School Meals, is near the top of the UK table. All these various issues are slowly coming to the fore: the perceived `culture war’, the deeper crisis over educational underachievement, the census trends, and Sinn Féin’s southern gains. Northern Ireland faces other major challenges, but these emerging points are fundamental. We may be reaching the marketing world’s `Rule of 7’ moment, when everyone grasps the combined implications.